Don’t miss out on the lower prices. Tonight, Monday (12/31), is the last day to take advantage of early pricing. Announced so far this year, Concorso Italiano will be celebrating the 50th anniversary of the Ferrari Dino GT (OK, and the Dino GTS). Not to be missed will be a continuation of the special Sports Car Market Alfa Romeo celebration. We have will have a special announcement soon about DeTomaso, and something special from Triumph. Yes, we know the Triumph is not Italian, but we will show the tie to Italy. More special guests and unveilings will be announced in the coming weeks as the event approaches. Tickets are currently only $120, Italian registration is $115, Global Exotics registration is $125, and Italian motorcycles are only $70. For our guests who prefer the full VIP experience we recommend the CI Club. Register to take advantage of these amazing prices. 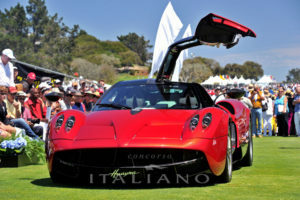 This will be our 34th year of celebrating Italian vehicles, fashion, food, and style. Make sure you do not miss out on all the excitement.